One little Christian fish, swimming against the current, flashing in the sunlit waters! 55 But He turned and rebuked them, and said, “You do not know what manner of spirit you are of. 56 For the Son of Man did not come to destroy men’s lives but to save them.” And they went to another village. I hope you will see that by the grace of God he truly was magnanimous! 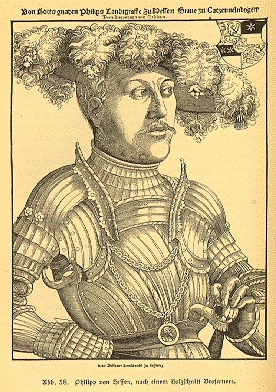 Philipp was Landgrave [Count] of Hesse, a region in Germany. When he was only five, his father died. Until 1518 he was under the regency of his mother Anna. and was one of the most zealous promoters of the Reformation in Germany. In his attitude toward the Anabaptists he showed extraordinary generosity and kindness. He saw in their movement a disorder in religious life, which had its roots in error and weakness in the faith rather than in moral error like sedition and revolt, and which must therefore be treated with lenience and consideration. Above all, he said, one must try to lead the Anabaptists back to the church by persuasion and indoctrination. His heartfelt policy was a matter of conscience. He would not agree to execute anyone for a matter of faith, where there was no other ground for taking his life. Otherwise no Catholics or Jews could be tolerated, he said, for they blasphemed Christ and they too would have to be put to death. When 18 Anabaptists were again seized in Hausbreitenbach and the Elector of Saxony demanded their execution, Philipp refused with the words, “Our Lord will give grace that they may be converted.” His hope was fulfilled in several instances. His policy included the abolition of vices in his realm because Anabaptists were offended by them. But they also included sharp punishment of foreign and local Anabaptists: beating, branding, and banishment. However, he wasn’t greedy of their confiscated goods but stipulated their return to the Anabaptists if they would depart his realm. Bekenntnis oder Antwort einiger Fragestücke oder Artikeln der gefangenen Täufer und anderer im Land zu Hessen vom 11. Dezember 1538 [Confession or answer of some questions or articles of the captive Baptists and others in the country of Hesse of December 11th 1538]. The statement was accepted by the Lutheran clergy. Eagerly Philipp accepted the proposal of Bucer to have these converts win their own brethren. He did not hesitate to deal with Anabaptists in person, and to his great joy most of them within his realm returned to the established church. Philipp’s sons and descendants held to this attitude. His spirit of gentleness and reconciliation lived on among them. In spite of his zeal in promoting the Reformation, Philipp’s personal life was marred by a licentious lifestyle and a bigamous marriage. In 1523, Philipp married Christine of Saxony and they had 10 children; then, in 1540 he married Margarethe von der Saale with whom he had 9. He argued with various Reformation leaders that because Scripture allowed men such as the Old Testament patriarchs to have more than one wife, he was therefore entitled to have two marriages. This situation led to a weakening of his relationships with other German Protestant princes. Neff, Christian and Richard D. Thiessen. “Philipp I, Landgrave of Hesse (1504-1567).” Global Anabaptist Mennonite Encyclopedia Online. April 2007. Web. 7 Nov 2017. Please go there for detailed citations. Adapted by permission of Herald Press, Harrisonburg, Virginia, from Mennonite Encyclopedia, Vol. 4, pp. 163-166. All rights reserved. ©1996-2017 by the Global Anabaptist Mennonite Encyclopedia Online. All rights reserved.